Gingerbread flavored coffee finally back in stock! Enjoying while building. When we build our Gingerbread Houses, most of us like to enjoy a cup of hot chocolate. A few members of our family like coffee instead, which is extra special this time of the year. 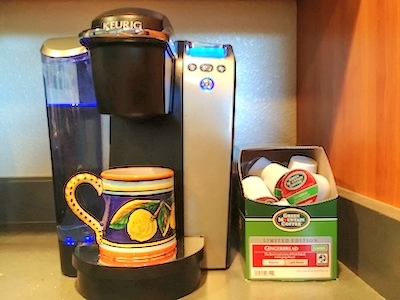 For the holidays, Green Mountain ships their Gingerbread flavored coffee K-Cups. Yum! We ordered ours early this year, over a month ago, and they finally showed up last week. Since they are showing available on all of our favorite K-Cup suppliers online, we assume all the back-orders have been filled. One of the better prices we found was from Amazon, who shows three different suppliers. Gingerbread flavored cream, which we have been adding to our coffee over the last month, is much sweeter than flavored coffee beans. The flavored beans add the taste that you can then sweeten as you like.